You’ve been struggling in your search for the best company to rent a shipping container from to your Roy, UT business. Other companies either charge too much for the services they offer, or they can’t deliver within the timeframe you need. Sound familiar? At Haulaway Storage Containers, it doesn’t have to be this way. We’re dedicated to providing only the best in customer service, because you deserve the best. As the leading industry experts, we pride ourselves on our high quality, clean, and secure storage container options. Stop paying a pretty penny for flimsy, basic storage containers. Our secure rentals are highly customizable and top of the line, so you won’t have to worry about value with us. Constructed from sturdy 14 gauge steel, our containers are impenetrable to wind, water, and tampering. Each unit features high quality hardwood and steel flooring, as well as double doors for easy access. We’ll deliver the most fitting option for you project, whether you need just 10 feet of space, or 40. Our 20’ and 40’ containers come equipped with an added layer of security thanks to our patented Rhino Locking System, giving you the peace of mind you deserve. 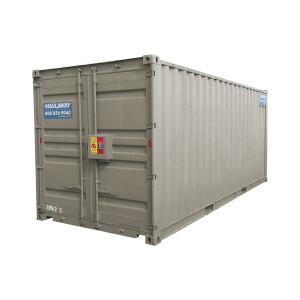 If you order a 21’ or 26’ container, these feature double doors on both ends of the unit. Double doors means increased circulation and easy access from both sides. With so many options, we truly believe that we are the best choice for your next storage container rental. Since our humble beginnings in 1958, Haulaway Storage Containers has grown into the best shipping container company in Roy, UT and the entire Western United States. We’ve perfected our delivery and pick-up system so you don’t have to wait for service. We know that life happens, and sometimes you need to quickly remodel the interior of your home or temporarily store the contents of your business. That’s fine – we can deliver by the next business day! Give us a call today to get the process started.